I find it impossible to criticize Wildfire, produced by Soulpepper/ RARE Theatre which manages to be endearing while still addressing serious issues of the abuse and neglect of disabled people who were instiututionalized in the Huronia Regional Centre during its existence, as well as the continuing stigma and marginalization in broader society. The play was directed and written by Judith Thompson, but researched, performed and fundamentally influenced by a group of theatre artists with Down Syndrome. In the opening sequence they establish emotional resonance by weaving their voices together in poetry, both original and by Gwendolyn MacEwen, expressing the despair of oppression and yearning for love. This scene is striking visually, with gowns hanging like carcasses from the ceiling, and eery lighting. This attention to the aesthetic, both visual and aural, continues throughout the production, conveying both sombre moods and brighter moments of direct address and comedy. As there are layers of atmosphere and tone as we move through the show, so there are layers of plot: there is a play within a play within a play. 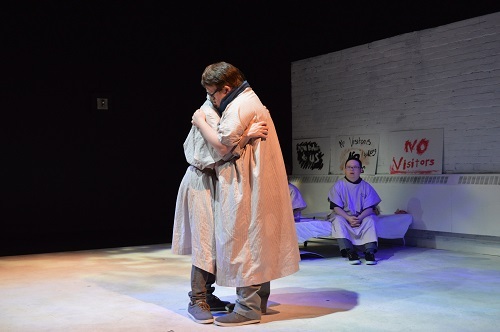 The play Wildfire presents a play about people imprisoned within Huronia, who in turn stage a radical adaptation of Romeo and Juliet as a protest. In their revision of Shakespeare, the lovers are star-crossed not because of their families but because one has Down syndrome and the other does not. As such, their relationship is viewed as exploitative and condemned to the point of being criminalized. This is a very real dilemma and brings up complex of questions of consent and autonomy as they apply to disability. The couple is played by two men, but no concern is given to homo/bisexuality, which I found incredibly refreshing. There is a sweet dynamic between them as they dance and kiss; in fact, I felt a caring connection between all seven actors as they dug into their own experiences and the history of people like them to present these three stories, nested like Russian dolls. The ensemble held space for each other, and for the people who died at Huronia, buried in graves unmarked except by a number. My experience of the show was partially as educational, partially as a call to empower people with disabilities such as Down Syndrome to live fully and to love, and finally also as a well-told narrative with characters worth rooting for.